Speakers: Nelson Nema, School of Business and Public Policy, University of PNG; Marcel Schröder, School of Business and Public Policy, University of PNG; Rohan Fox, Research Officer, Development Policy Centre. The colourful banners and huge campaign rallies of the 2017 Papua New Guinea National Elections held in June and July may have put policy on the backburner for some as they were swept up in the excitement of the vote. But one issue was never far from voters’ minds as they headed to the polls — the concerning state of the country’s economy, and the impact on their own lives. The returned O’Neill government faces major economic challenges. So what are the problems, and what should the Prime Minister and his new Treasurer do about them? 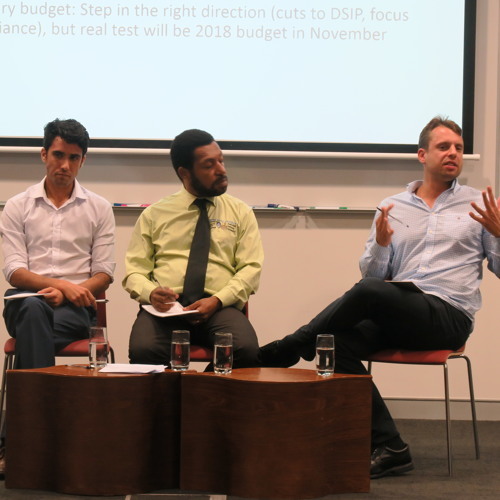 Marcel Schröder, Rohan Fox and Nelson Nema presented their 2017 PNG Economic Survey, co-authored with their colleague, Stephen Howes, on 11 October 2017. The panel was chaired by Michelle Rooney. This was the first in a two-part series on PNG after the 2017 elections. This event was presented as part of the Development Policy Centre’s PNG Project, which receives funding from the Australian Aid Program through the Pacific Governance and Leadership Precinct.